Your crafts are very beautiful. I know you will sell out quickly. Crafting with your Mum must be ever so fun. I love everything that you have made. You and mum are quite talented. It's so nice you two can work together on projects. Kate the shell balls and beeswax candles interest me! I must get to your sale..let us ..me know where!! Everything you made is beautiful. 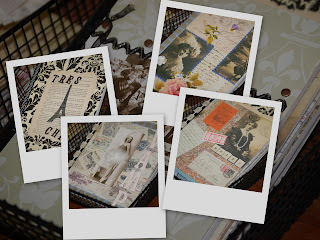 I especially love the journals! It all looks divine and fine. I wonder if I would ever make it out to one of your shows? Tell me where it is, and I will come and purchase! I love it all. 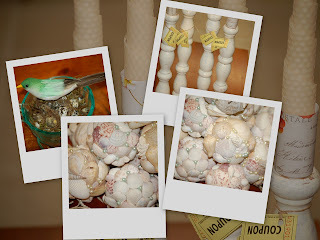 Especially the seashell balls, what treasures! You will sell everything so quickly, I know it! Oh My Gosh! I was wandering through the shops at Charleston Place the other day and WHat did I discover??? A new Papyrus store! I have never been in one. I was mesmerised! THey have the coolest cards ever! THey had very few embellisments and the like though! But THE cards!!! Your collages are darling! How fun...memories are made of just this...You must be a young one...how do you sell your things? Oh Kate...your art is gorgeous. You have such a talent...you and your Mother are such special people. I want to try the name meme this week. I will come up with a different spin on it since I did it awhile ago! I do want to play though! What beautiful creations! Would love to see one of your shows! You've created some beautiful things here Kate - they will sell well I think. Don't you just love paper - so many gorgeous ones out there to inspire. My heart races when I shop Archiver's and other scrapping shops - so much stuff I want to bring home to play with! 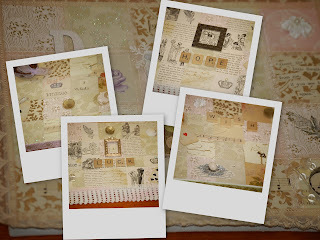 I love your collages and your journals. Everything looks lovely.